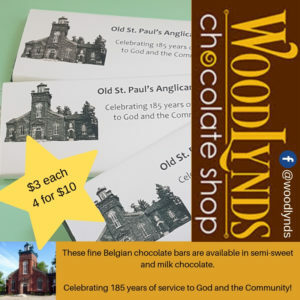 As part of the commemoration of Old St Paul’s 185 years of service to God and the community, we have produced exquisite Belgium chocolate bars bearing this news. They are available at coffee hour after the 10:30am service at church each Sunday or by visiting the church office. The cost is $3.00 each or 4 for $10.00. Get them while they last.